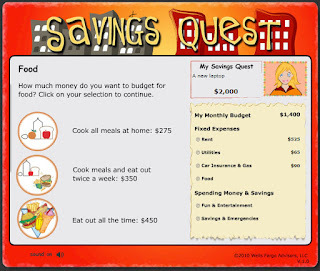 Savings Quest is a wonderful site to teach kids about money, spending, budgeting, and saving. Users choose a character, a job, and a short term savings goal. Then the user must budget their rent, car expenses, and other living expenses. Then the user "works" to earn a paycheck and pays the bills to see what amount is remaining for savings and emergency expenses. Occasionally unexpected expenses such as doctors visits will take away from the savings. This interactive activity is a great way for students to understand the real money issues that they will face once they start working. This would be a great activity for middle school students. Thanks for the link. This looks perfect for my 6th Grade math students.